Pioneers in the industry, we offer spray dryers from India. 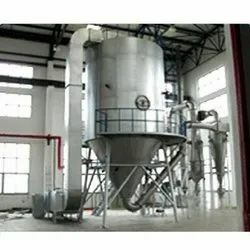 Spray drying is the transformation of feed from a fluid state into a dried form by spraying the feed into a hot drying medium. The feed is pumped from the product feed tank to the atomizing device, located in the air disperser at the top of the drying chamber. The drying air is drawn from the atmosphere via a filter by a supply fan and is passed through the air heater to the air disperser. The atomized droplets meet the hot air and the evaporation takes place, while cooling of the air happen simultaneously. In Spray Drier, after the spray is dried in the drying chamber, the majority of the dried product falls to the bottom of the chamber and enters to a pneumatic conveying and cooling system. The fines, which are the particles with a small diameter, will remain in the air, and it is therefore necessary to pass the air through cyclones to separate the fines. The fines leave the cyclone at the bottom via a locking device and enter the pneumatic system, too. The air passes from the cyclone to the atmosphere via the exhaust fan. The two fractions of powder are collected in the pneumatic system for conveying and cooling and are passed through a cyclone for separation, after which they are bagged off. The instrumentation comprises indication of the temperature of the inlet and outlet air, as well as automatic control of the inlet temperature by altering the steam pressure, amount of oil or gas to the air heater, and automatic control of the outlet temperature.by altering the amount of feed pumped to the atomizing device. Control of particle size. Spray dryers can typically produce between 30 to 500 micron average particle sizes, in a bell shaped distribution. The shape of most spray dried particles is spherical, which provides for fluid-like flow properties. Spray drying produces the most homogeneous product. Many heat sensitive products can be spray dried easily at relatively high inlet temperatures. Permits drying without thermal degradation.